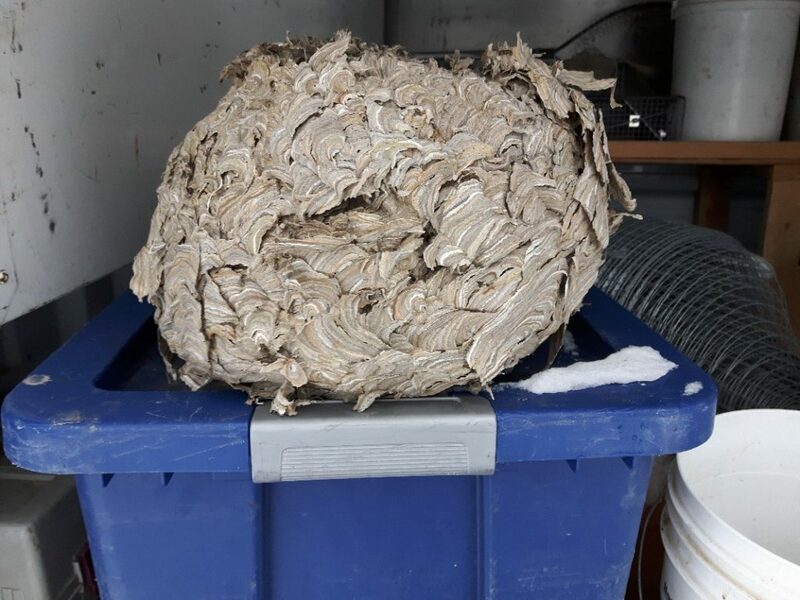 This huge wasp nest was retrieved from a homeowner’s attic. Luckily it was old, and was not active. Last week, one of our service technicians had the experience of finding this huge wasp nest in a customer’s attic. Our technician had to crawl through the attic to locate this nest, not knowing if it was alive with hundreds of wasps. Luckily, he found that it was an older dead nest. The technician used all the necessary safety equipment in the removal of the wasp nest, including a bee suit, head gear, and gloves just in case. Using his skill and pest control knowledge, he was able to safely remove the wasps nest. Wasps are considered beneficial by eating other insects. However, they can be very dangerous to humans as their sting can cause severe pain. For those who are allergic it may even cause a life-threatening allergic response. Although they do not typically sting unprovoked, they will attack if they feel that themselves of their nest is threatened. Wasps will not die after they sting and can sting multiple times. They also produce an “alarm pheromone” that stimulates a general state of alarm in the colony and may cause other wasps to aggressively swarm the “intruder”. Unfortunately, the areas surrounding residential, cottage, and commercial properties provide ideal nesting areas for wasps. Some of these areas include verandas, ceilings, attics, walls, trees and shrubs, and in the ground. It is important to inspect these areas, especially during the summer months when wasp nests are most prominent. If you have a wasp nest on your property, it is recommended that you do not attempt to remove then nest yourself. At Greenshield Pest Control, our technicians have the experience and knowledge for safe removal of wasp nests. Our Pest Control Technician will perform a proper assessment and removal to ensure that your home is wasp free. They will assess the property or area of infestation, and identify the reasons that led to the infestation. The next step is removal of the wasp nest. Depending on the nature of the nest, chemical treatment might be needed. Greenshield offers a variety of warrantees, to ensure that you are satisfied with the service you are provided. Call us for more information about how to deal with wasps and other pests. One of our customer service specialists will be more than happy to help you take the necessary steps to solve your pest problem.